The use of volatile oils (essential oils) extracted from various plant parts such as seeds, fruit peels, barks, flowers, leaves, berries, resins, stems and roots intended for the healing of mind, body and/or spirit. In ancient China, Shennnong, “The Divine Farmer,” was considered to be the first known herbalist. Supposedly, in 2737 BCE, Shennong first tasted tea from tea leaves on burning tea twigs, which were carried up from the fire by the hot air, and into his cauldron of boiling water. China has been using aromatic herbs as medicine since the time of Shennong, and recent evidence suggests that the Chinese devised distillation equipment long before the Persian doctor Avicenna (980-1037 CE), who is credited with creating the first steam distillation unit. In ancient Egypt, Imhotep (2655-2600 BCE) was considered the father of Egyptian medical science. He mainly used medicinal oils, herbs and aromatic plants as medicine. Dating back to 1500 BCE, the Ebers Papyrus was one of the first medical scrolls ever written in the history of mankind. It contained over 800 formulas that used aromatic herbs and medicinal oils, or plants from which essential oils are produced today. French chemist René-Maurice Gattefossé is considered the father of contemporary aromatherapy, and is credited with the creation of the term aromatherapy. In 1910, the day of the birth of his son, he became the victim of an explosion in his laboratory. Very badly burned, to the point of gas gangrene, he instinctively decided to plunge his hand into a vat of lavender essential oil that he had in his lab. The results were staggering, and confirmed his intuition that lavender essential oil has antiseptic, anti-inflammatory and cicatrizant properties. After such an amazing personal experience, he went on to dedicating his life to analyzing essential oils, writing the first book on aromatherapy, and educating other European medical doctors about the amazing healing properties of essential oils. 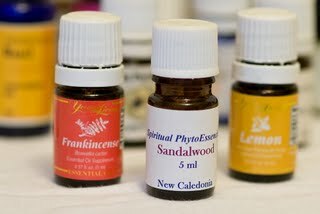 Various methods of administration can be used with essential oil therapy. It is part of the art and science of aromatherapy for the practitioner to know the proper dosage, dilution, duration and the best route of administration for any given patient based on their condition. Three general administrative routes exist, each with several unique ways to administer the essential oils. Topical: Massage, compress, neat on acupuncture points, in various herbal products such as bath salts, salves, lip balms, insect repellents, etc. Smell is the most primal sense we possess as humans. If we look back into the history of mankind it becomes apparent that our sense of smell played a necessary role in the survival of the species. Scents are various types of qi, or bits of information, that are processed by the brain and decoded so as to elicit the appropriate response. Next, the body is set in motion as that information is passed on through the nervous system, creating the various physiological responses that are needed in any given situation. This is HOW an essential oil works its magic on the physical level, but essential oils do not work strictly on the physical level. The mind, emotions and spirit are all reached by essential oils as well. One can think of essential oils as penetrating to the innermost regions of the brain (hypothalamus, pituitary) to affect the mind, emotions and spirit, but really it is much more profound to think of essential oils as engaging directly with our spirit to create a soul-to-soul relationship between us and plants; a relationship that requires the essential oil to be recognized as a sacred living being. Essential oils are full of qi, or life force, just like human beings are from the perspective of Chinese medical theory.